Quick post about a new service called support.com. I found it on the money.cnn site. The article points out that each month a busy family probably spends up to 12 hours trouble shooting and maintaining their computer. This is quite a bit of time away from those 'quick moments'. 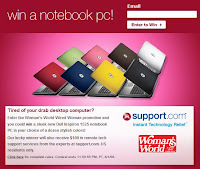 The reason for including within scope of the blog is that they have a sweepstake going at the moment called, Wired Woman Sweepstake, to win a laptop and support services. They're obviously seeing an advantage of directing themselves at the female home decision maker - has providing technical support to the family now come up as a skill we need to have? The service is going to be featured in July's edition of Women's World Magazine. So advice for the day is - back up your machine, you'll regret you didn't sometime soon no doubt according to statistics.